These sessions are recorded and are available for purchase online at any time. View 1 hour presentation free. The American College of Veterinary Ophthalmologists (ACVO) is a worldwide leader in the specialty of veterinary ophthalmology, recognized by the American Board of Veterinary Specialties of the American Veterinary Medical Association (AVMA). In continually advancing the scientific and clinical aspects of this discipline, granting funding for new research in animal eye diseases and treatments, providing education and communication between those in the field, and establishing rigorous criteria for specialist training and certification, the ACVO and its members set the standard. Veterinary ophthalmologists are committed to providing the very best in patient care. The level of excellence set by the ACVO extends to both the exam room and the operating room. Microsurgery on the cornea or intraocular structures in particular demands a level of skill that only comes with time, experience and training. This applies to acquiring not only the appropriate technical proficiency to perform microsurgery, but also the clinical judgement needed to identify when it is needed, or to deal with potential complications. Special instrumentation and a competence with the necessary equipment is also needed. Just as you would likely prefer an experienced microsurgeon if you needed corneal or intraocular surgery, so might you prefer it for your pet. This Statement should not be considered a legal or medical requirement, nor does the statement have punitive ramifications. However, the ACVO believes that veterinary patients deserve the best care delivered to the highest standards whenever possible. That is why the ACVO strives for excellence in all aspects of veterinary ophthalmology, and continues to earn respect around the world. SUBSCRIBE TODAY! 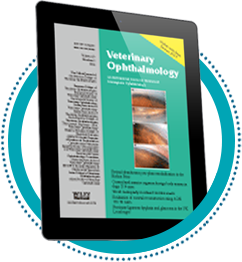 Six Issues Annually - See rates and/or subscribe to the Veterinary Ophthalmology journal through Wiley Publishing. With the move to online-only Veterinary Ophthalmology journal access, we were able to arrange for complimentary online access to the journal for all ABVO residents that have a mentor who is a current ACVO Member. This is a wonderful benefit for ACVO members to be able to provide to their residents annually!